A Magen David in the center of the piece sits inside a circle. The right and left sides are finished in a swirl design that looks like the twirled ends of a candy wrapper. The glass is textured and opaque in ambers, milky whites, yellow, deep greens and purples. The window sits in a wooden frame that measures approximately two inches. Originally organized as the Elias Einczig Congregation in 1911 (Orthodox), it was reorganized as Bnai Moshe in 1917. Since 1939 it has been affiliated with the Michigan Synagogue Conference. The first services were held in a rented hall at Hastings and Adelaide Streets. A house, at the corner of Eliot and Hastings Streets was purchased in 1915 and occupied until 1917. The first synagogue at Garfield Avenue and Beaubien Street, was dedicated in 1917. A brick community center type structure at 3710 Lawrence Avenue was dedicated in 1929. Moses Fischer served as rabbi beginning in 1923. In 1935 the Detroit Hungarian Hebrew Congregation merged with B’nai Moshe. In November 1994 Rabbi Abie Ingber visited the site of the former B’nai Moshe Synagogue, now the St. Paul African Methodist Episcopalian Zionist Church. Awed by the beauty of its stained glass windows and hoping to find some left behind artifact from B’nai Moshe that would not be important to the building’s current occupants and yet tell the story of the Jewish community that gave it life, Rabbi Ingber asked the minister, William M. White, Sr., for a tour of the building. 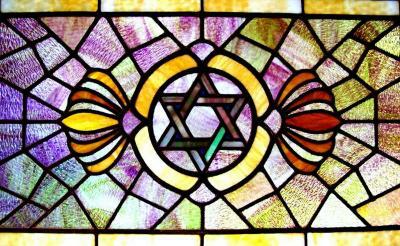 In a small dimly lit basement storage room Rabbi Ingber saw a Magen David stained glass window. Before the rabbi left, he and Pastor White struck a deal. The pastor agreed to allow Rabbi Ingber to take the window for the Hillel museum and the rabbi offered to make a token donation for the church’s restoration project.